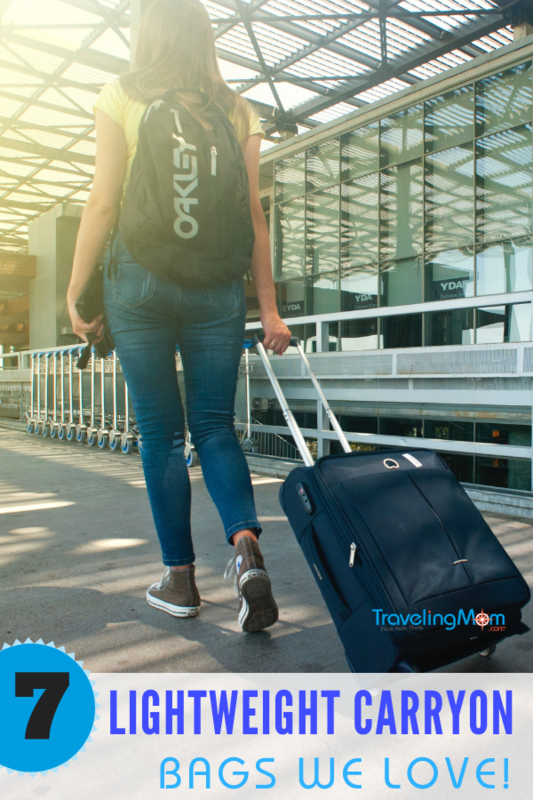 Traveling with carry-on bags not only saves money, but also helps speed you to your destination without waiting at baggage claim. 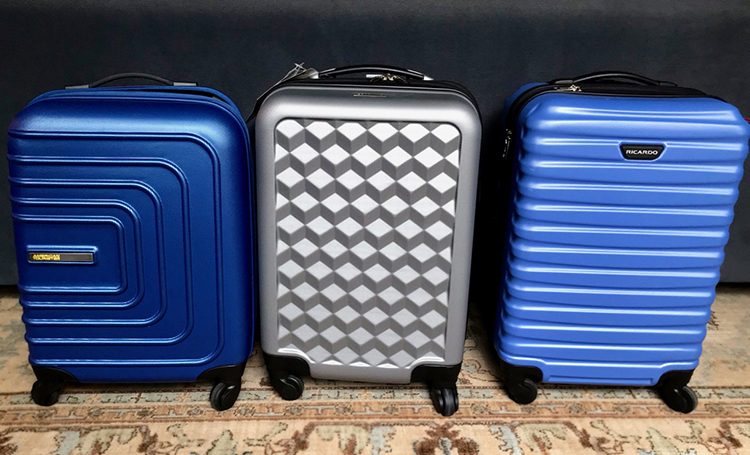 We’ve put together a great list of some of the best and lightest carry-on luggage that will fit in the overhead bin, but still hold plenty of clothes for your getaway. If you have a traveler on your holiday list, one of these bags would make for a great gift. With baggage fees on the rise with nearly every airline, carry-on luggage can save you quite a lot. The weight limits for checked bags, may mean that you need to check more than one. For example, the average family of 4 could spend over $60 extra for 2 checked bags. If each family member travels with a carry-on bag, you can avoid these fees. So why travel carryon? 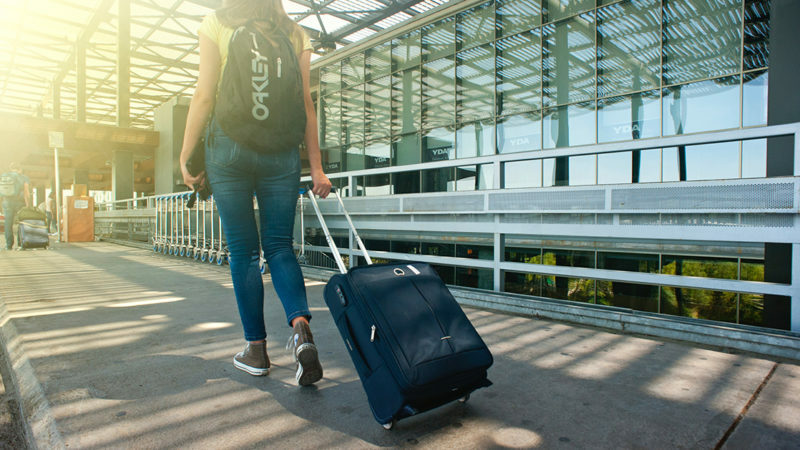 I asked our Traveling Moms and a few travel experts about the benefits of traveling carry-on instead of checking bags. For me, I love using carry-on luggage so that each of my family members can pack their own bags. If it fits, they can bring it. 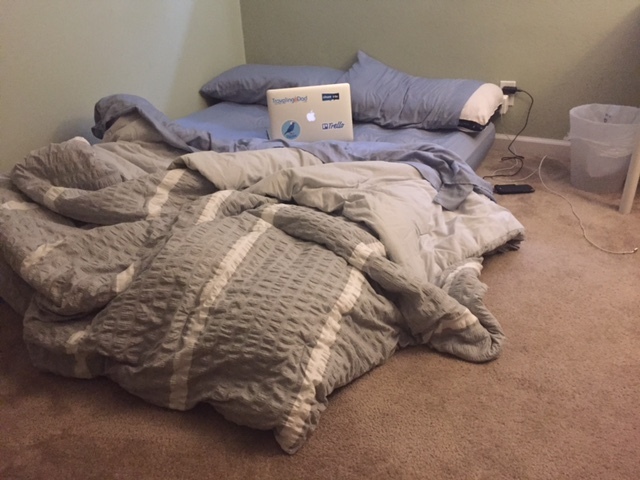 Since I travel with teens (one being a fashionista girl), this method works really well. Texas Traveling Mom, Jill Robbins agrees. She says, “It [traveling carry-on] keeps me from packing stuff I don’t need. Checking bags and retrieving them at baggage claim can be time-consuming. Jill says, “It’s easier to maneuver my family from airport to hotel. If we’re all traveling light. I get to where I’m going without having to wait.” I agree, when we get to our destination, we want to get to our accommodations so we can hit the beach, hiking trails or theme park as soon as possible. If you are traveling on a fully-booked flight, most airlines will ask for volunteers to check bags for free. We sometimes take advantage of this offer when we are flying non-stop. We always keep valuables and electronics in one carry-on. Especially when traveling with kids, it’s nice to have easy access to items they might need like a toy, coloring book, sweatshirt or blanket. Airports are often freezing so I usually need access to a sweater. Ricardo bags are favorites of our Traveling Moms. My husband also has one and loves it! He says it’s just right for his business trips. He’s even packed for 5 days in it. 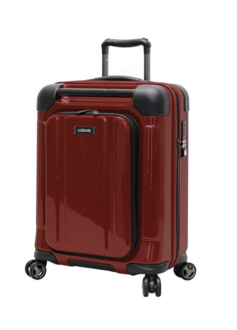 Durability is the hallmark of this brand’s expandable carry-ons, especially the hard sided polycarbonate models. Four rubberized wheels provide added stability and durability as well. 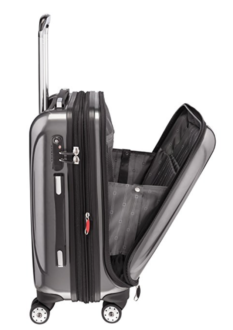 Independent travel agent Tricia Kirkwood from travel-by-tricia.com recommends this lightweight carryon to her clients. She says, “My son is 4 and having easy luggage while I have him in tow has been ideal. It’s lightweight, compact, and comes in some great colors.” It’s sized for international travel with a PowerScope handle that locks at both 38 and 42.5 inches for different heights. 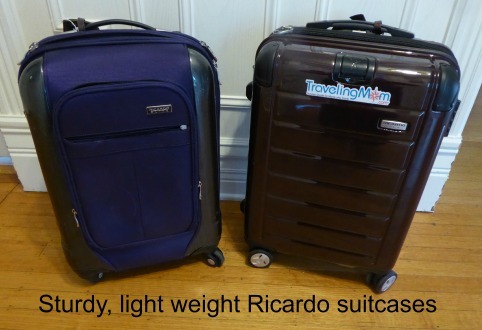 Christina Conrado reached out from Adiamo bags to highlight the features of this great lightweight carry-on. “It’s very maneuverable with easy gliding 8 spinner wheels. It’s made of durable carbon fiber with strong zippers to keep your items safe during travel.” According to the company, this bag has also been tested extensively for fitting in most overhead bins both domestic and abroad. Storage capacity is approximately 29L. Wanting to get a lightweight bag for each member in my family, I recently purchased this one for my son. He used to have a smaller bag with a handle that did not extend very far. Now that he’s 6’1″, he needs a “big boy” bag. He says, “This glides super easily and I love how lightweight it is.” Now he’s got room for not only his clothes, but his size 12 shoes too. 5. American Tourister Sunset Cruise Hardside 20 inch – Great for kids! Kids will appreciate the fun colors of this bag like Apple Green and Pink Berry. 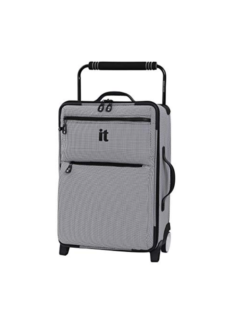 Has an ABS scratch resistant texture and spinner wheels for a smooth ride. I have a royal blue one that I’ve brought on many weekends away. It may look small, but it actually holds quite a lot. Texas TravelingMom, Jill Robbins, our “packing light” expert uses this bag frequently in her travels. 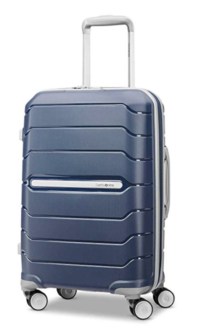 This is the bargain of the bunch and the lightest carry-on luggage on our list At only 4.8 pounds. It is not a spinner so it’s not quite as easy to move around with, but travel writer Jill Bowdery from ReadingTheBookTravel.com says she loves it! She especially likes the wide, soft-grip handle. Although there are only 2 wheels, they are very smooth and silent. 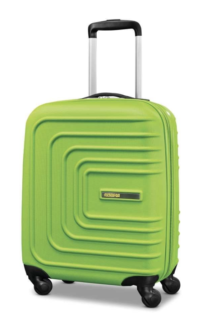 Road Warrior TravelMom, Nasreen Stump says her sister purchased this suitcase for a European vacation and loved it. This model has a unique front pocket with a built-in padded sleeve for up to a 15.6-inch laptop. 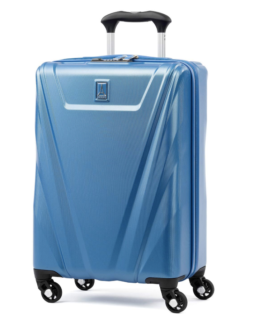 Keep in mind that many manufacturers do not include their wheels in suitcase measurements. It’s not a bad idea to add about 2 inches to be safe. Try to pack without using the expansion portion of your suitcase, this helps ensure it will fit in the overhead bin. If they fit easily, keep this in mind as an area to expand for souvenirs. Another way to bring souvenirs and gifts home is to pack a lightweight duffle that can fit under your seat. Some international airlines have smaller carry-on restrictions so double check before you fly. Check out this great list from Skyscanner for a size chart by airline. 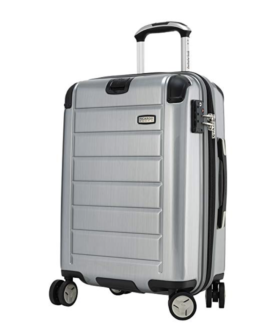 Have other suggestions for lightest carry-on luggage? Let us know in a comment. Previous Post: « Best Holiday Lights in the Northeast U.S.